ShowWorld Entertainments at Convoy In The Park, providing fantastic roaming festival fun! 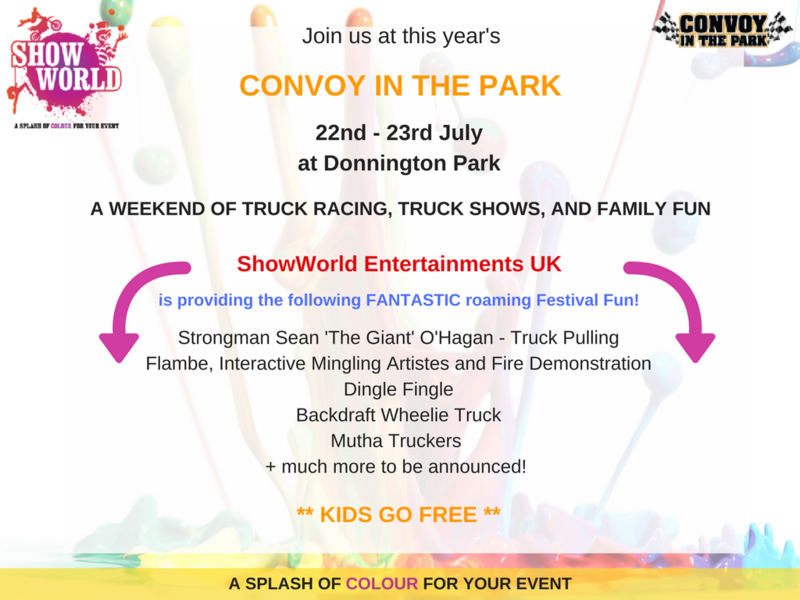 Come and see us perform at Convoy In The Park, a family festival with great music, truck racing, and an action arena that includes drift trucks and cars. Tickets start from £15 and kids under 14 go FREE! Sean O’Hagan is no normal human being, in fact, he has been called ‘A Freak of Nature’, while others call him ‘the Giant’. Wikipedia states he stands at 212 cm (just under 7 feet) in height. He is the tallest currently active professional strongman competitor and is amongst the tallest in history. His weight of 200 kg (over 400 lb, or over 30 st) also makes him one of the heaviest strongmen around. So, we decided we’d have him pulling some trucks at Convoy in The Park for your entertainment! 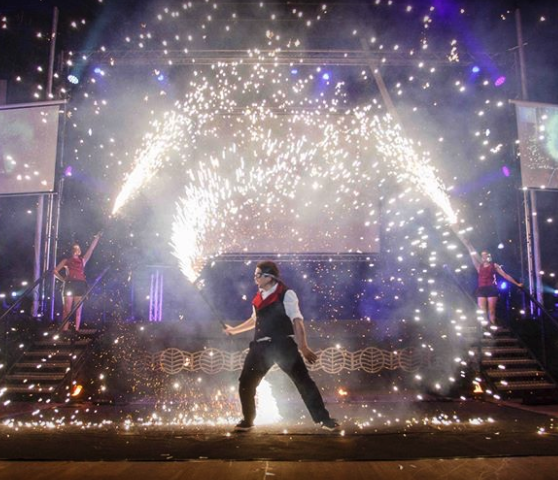 Specialists in choreographed fire and glow shows, Flambe ensure that your event experience is one to remember. Flambé have a veritable feast of incendiary delights and delicious distractions on the menu, and considering that one of their specialities is fire performance, it seems apt that they are the flaming crescendo to an event; adding theatricality, action, and entertainment in their own unique way. 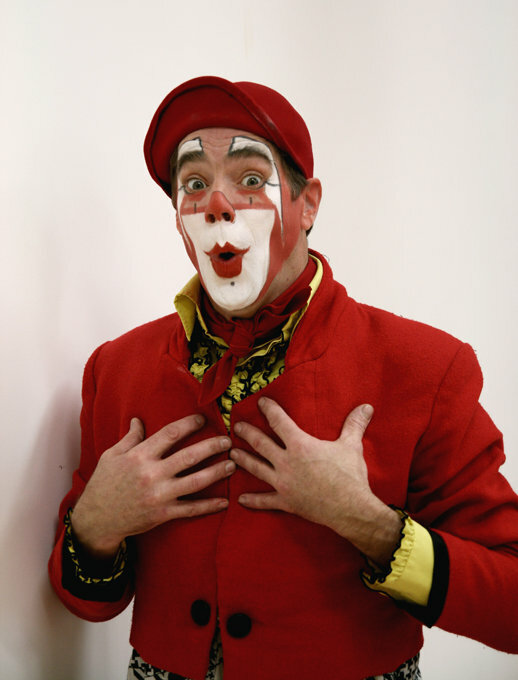 Dingle Fingle – Impresario, performer, a bespoke human being, not your average mortal. This remarkable man performs street shows, physical theatre, and magic. From Covent Garden to Venice Beach, Blackpool to Abu Dhabi, Dingle Fingle always draws a huge crowd! 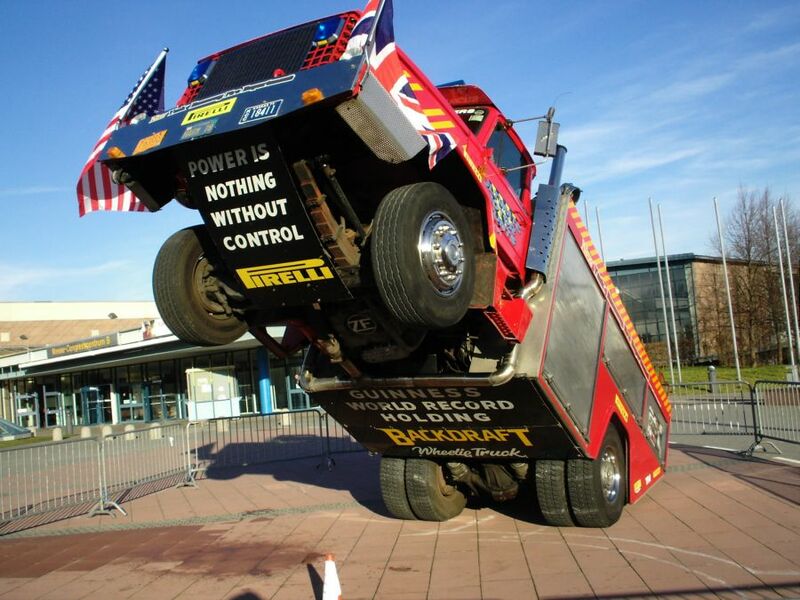 The Backdraft Wheelie Truck is unbelievable – when Steve hits the accelerator the front of the truck jumps 15ft into the air! It’s a massive 20 ton Fire Engine that thinks it’s a wheelie bike! Steve performs the seemingly impossible by steering, stopping and pirouetting the truck on the two rear wheels only. Adding to the spectacular display is a custom-built vertical exhaust system which incorporates a Steve Murty speciality of 3 metre flames and fireballs. A comedy take on the glamorous world of female truck driving – logistics with lipsticks. Pull into the crawler lane, Eddie Stobart, and best hide your Yorkie bar, cos our heroines of haulage are gonna knock it up a gear, blow your doors off, and kick you to the kerb! These are tough girls in a man’s world. They exist in an exciting and adventurous whirlwind of CB Radio jive, line dancing, and rough trucking songs. Oh and the odd bit of knife throwing if someone cuts them up! Any questions about the event, any of the acts, or to book ShowWorld to manage your event, don’t hesitate to contact us!